Touch control comes to the A-Series! You'll love the ease and familiarity of controlling PowerShot A3400 IS digital camera with its big 3.0-inch Touch Panel LCD. Touch control comes to the A-Series! You'll love the ease and familiarity of controlling PowerShot A3400 IS digital camera with its big 3.0-inch Touch Panel LCD. Touch to shoot, choose shooting modes and select settings - it's easy and intuitive. The camera makes it easy to get the best possible quality from every shot, too, with Smart AUTO that selects proper camera settings based on 32 predefined shooting situations. Simply push the dedicated Movie Button, and you'll be shooting gorgeous 720p HD video. With the 16.0 Megapixel Image Sensor and the power of the DIGIC 4 Image Processor, resolution is spectacular and performance is ultra-fast. Beautiful image quality with today's touch-panel interface makes PowerShot A3400 IS digital camera an easy choice. A 3.0-inch touch panel LCD offers easy and intuitive operation and Touch Shutter makes capturing photos easy and interactive. The PowerShot A3400 IS digital camera's large and bright 3.0-inch LCD screen makes it easy to view and frame your shots in high resolution (230,000 dots). You can view the LCD screen over a surprisingly wide angle ? above, below or to either side ? without color shifts and with minimal reflections. A scratch-proof hard coating and a dust-repellent fluorine coating ensure a durable screen that dependably displays clear, vibrant images. The PowerShot A3400 IS features touch panel technology that makes using the camera more intuitive and fun. Simply touch the screen to choose and track an AF point, change camera settings, record and play videos and much, much more! It also has an innovative Touch Shutter function that allows you to release the shutter right from the screen. Just touch the desired subject with your finger. An AF box will appear and track the subject as it moves. Then just lift your finger to release the shutter. It's that simple. Smart AUTO intelligently selects the proper camera settings based on 32 predefined shooting situations for capturing spectacular images with ease. Photographers of all levels appreciate a camera ? especially a go-anywhere compact digital ? that takes the hassle out of capturing beautiful images. The PowerShot A3400 IS gives you Smart AUTO - sophisticated Canon technology that makes getting that great shot as simple as pressing the shutter button. Smart AUTO automatically detects scenes by assessing various factors in both the background and the subject. Detected scenes are analyzed using 32 predefined shooting situations. The camera then makes optimal settings to ensure the best possible image capture when shooting still images. Smart AUTO also includes Advanced Subject Detection, which allows the camera to detect and track non-human moving subjects like animals and vehicles. With Smart AUTO, all you have to do is frame your shot and capture away. Shoot brilliant 720p HD video with a dedicated movie button. You can shoot high definition video anytime, anywhere right from the pocket-sized A3400 IS digital camera. With a simple push of the dedicated movie button, you'll be able to instantly record every moment in motion. 720p HD video is smooth, vivid, and beautifully lifelike, making it an ideal way to capture special memories. In addition to being able to shoot 720p HD video at 25 frames per second, the PowerShot A3400 IS can also shoot 640 x 480 VGA video at 30* frames per second. *Actual frame rate is 29.97 fps. It's never been easier to shoot videos with a PowerShot digital camera. To make shooting video as natural as snapping pictures, the PowerShot A3400 IS has a dedicated movie button. No need to plan ahead, no need to search through menus on the LCD screen; when you feel a moment would be best captured in 720p HD, simply press the button and recording begins. The camera is always ready to shoot stills or video whenever you want. With the PowerShot A3400 IS digital camera, you can also shoot video in the Apple iFrame format, which is a computer-friendly standard that speeds up importing and editing of videos. It keeps file sizes small, making it more convenient to upload or e-mail high-quality videos. The iFrame format enjoys native support in compatible Mac and Windows video applications, making it unnecessary to perform time-consuming and often quality-degrading conversions. A 16.0 Megapixel Image Sensor with DIGIC 4 Image Processor for exceptional performance. With the camera's 16.0 Megapixels of resolution, your images are rich and clear, with textures and tiny details faithfully reproduced even at the long end of the 5x Optical Zoom. This high level of resolution is ideal for creating the largest prints, and allows you the flexibility to blow up and crop any section of an image to express your creativity. The DIGIC 4 Image Processor powers the camera's advanced systems and features, ensuring fast, reliable performance with low battery consumption. Canon DIGIC Image Processors have set the standard for functionality and performance since their groundbreaking introduction in 1999. With each successive generation, DIGIC processors have brought elevated performance and powerful new features to PowerShot digital cameras. The DIGIC 4 Image Processor has ushered in a new level of picture quality and accelerated processing, making possible features such as high-speed continuous shooting, HD video and Face Detection Self-timer. 5x Optical Zoom with 28mm Wide-Angle lens and Optical Image Stabilizer deliver stunning images. The 5x Optical Zoom (35mm equivalent: 28-140mm) in PowerShot A3400 IS digital camera delivers outstanding optical performance and versatility. It gives you a great range of potential images from a single location, which is perfect for sporting events and other occasions when your shooting stance is fixed, or times when moving in too close might disrupt the action you're trying to capture. The lens's 28mm wide-angle perspective puts more image in every frame for dynamic, exciting shots. Intelligent IS automatically chooses from six different modes to optimize image stabilization for the shooting condition. The latest advance in Canon Optical Image Stabilization technology, Intelligent IS analyzes camera movement and applies the best shake correction method for the shooting situation. For stills, the system automatically selects among Normal, Panning, Macro (Hybrid) and Tripod IS modes. When shooting video, the system automatically selects among Dynamic, Powered, Macro and Tripod IS modes. With Intelligent IS, you can concentrate on image capture, letting the camera make the most effective IS settings to assure the steadiest possible image. Help Button provides simple explanations and easy controls of your settings. The PowerShot A3400 IS digital camera is designed to be fun and easy to use, even for beginners. A new Help Button on the camera's exterior brings up the help menu any time you need it, right on the LCD screen. From here, you can scroll through a variety of topics that answer your questions with clear explanations, offer helpful shooting advice, and show you diagrams highlighting the position of any buttons you'll need. Scene Modes such as Super Vivid, Poster Effect and Miniature Effect provide creative freedom to capture your photos. Scene Modes are fun, easy ways to give your shots a distinctly artistic feel without the need for any extra lenses and filters. Super Vivid heightens and saturates colors for eye-popping intensity. Poster Effect eliminates gradations between colors for an illustrative feel. Miniature Effect enhances perspective in a scene, blurring the top and bottom to make it look as if it were created with miniature models. You can also make a quirky portrait using the Fisheye Effect or add a beautiful single-tone effect with Monochrome. Toy Camera Effect simulates a vintage look as it capturing the photo using a "toy" or pinhole camera. Lithium-ion battery makes it easy to recharge your batteries. 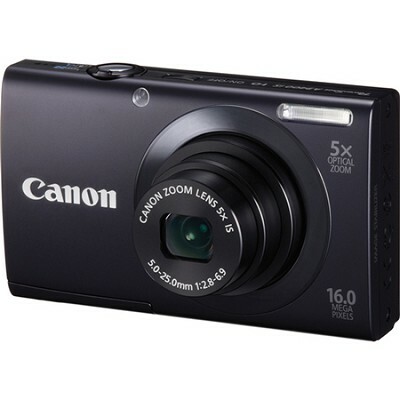 The Canon PowerShot A3400 IS digital camera uses a rechargeable Lithium-ion battery. This compact, powerful battery helps make it a lightweight and slim camera. Charge-up is quick and easy, so the PowerShot A3400 IS will be ready and waiting for those special moments.